As mentioned in the prior post, high calcium can be caused by 1 of our 4 parathyroid glands growing abnormally large. 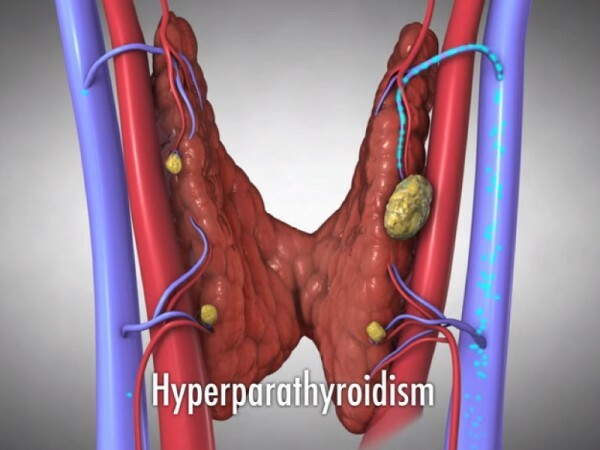 When a high calcium is caused by hyperparathyroidism it is a single adenoma in 85-90% of cases. This is NOT a cancer, it is just ‘sporadic’ growth of the gland for reasons we do not yet know or completely understand. A normal parathyroid gland weighs in the region of 30-50 mg (about the size of a grain of race or lentil). An adenoma will typically weigh >100mg, and it is not unusual to see glands >1,000mg! However, it is not always the case that the largest glands cause the most trouble. 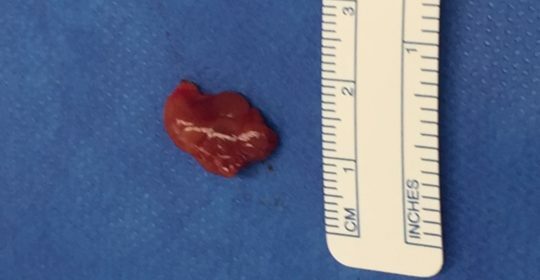 The photo here shows a typical appearing parathyroid adenoma, which weighed in at 275 mg. This particular patient had high calcium causing kidney stones, as well as severe fatigue and muscle aches. It was only 2 weeks after surgery and she was feeling well again, and said she had more energy than in years! Success stories like this motivate our team to get the word out to all patients… get that calcium checked and taken care of if it is high.